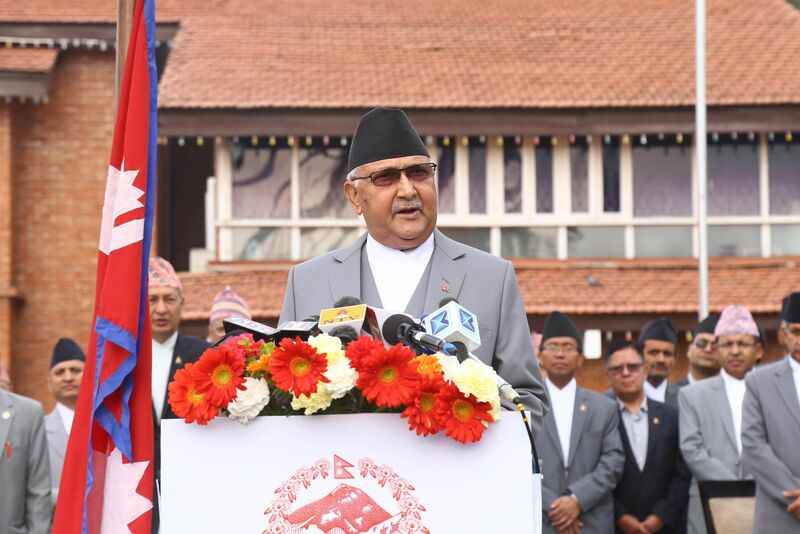 Kathmandu– Prime Minister KP Sharma Oli has said the Nepalis aspire for peace, unity and development, and that he was committed to these very goals. PM Oli said this in his address to the nation on the occasion of the New Year 2076 he gave from his official residence at Baluwatar this morning. On the occasion, he resolved to continuously fight against corruption and anomalies, terming these as the hindrances to good-governance and prosperity. "Our constitution itself has guaranteed the protests or differences that are carried out in a peaceful manner. The undesirable retrogressive efforts and the anti-constitutional activities would be controlled sternly," he said. Calling on all Nepalis to be cognizant of the time while we are welcoming the new year and bidding farewell to the old one, PM Oli maintained that the government under his leadership was working with the goal of lifting up the country from the 'pathetic status' of a underdeveloped country to a higher status within its this very term and the goal of meeting the sustainable development goals set for 2030. He stressed that the incumbent government was working seriously to maintain good governance, recalling that he had launched a campaign against irregularities and corruption last year to that connection. "This year also, I am determined to carry out works by keeping good governance on top priority," he asserted. The PM stated: "Good governance, a refined and dignified life, civilized and just society, healthy and balanced environment, strong democracy, national unity and respect are the indicators of 'happiness'. The various programmes including the employment, social security and investment schemes that we have implemented are parts of that prosperity. Good governance is a prerequisite for prosperity." "We bid adieu to the 2075 Bikram Sambat Year since last night. The previous year had started on a note of hope, excitement and expectations. We all put in our best efforts from our respective places throughout the year to make the country prosperous. I would like to extend thanks to all Nepali sisters and brothers in this morning of the New Year's Day today." Recalling that the School Enrollment Campaign had been launched from Rara of Karnali on New Year's Day last year and many questions like how could good schools be established for educating our children, how could good roads be constructed, how could adequate human and physical resources be developed, how could electricity be generated from the Karnali river and other rivers of the country to illuminate the villages and remote settlements, how could the land that was barren could be cultivated by developing irrigation and how could the foundation of the federal setup that was only recently established be made stronger, were in his mind while announcing that campaign, PM said now we have reached to the state where we are able to mention some progress on these issues rather than putting questions. PM Oli noted: "We have been able to change the negative thinking 'the country cannot be built and works do not move ahead' to the confidence that 'works can be carried out and Nepal can be made prosperous within our lifetime'". In this connection, he referred to : 'A World Ready to Learn', a report published recently by the United Nations Children's Fund (UNICEF) which states that student enrollment in the pre-primary education in Nepal was 86 per cent which is ahead in the world; to international financial institutions' officials participating in the Nepal Investment Summit 2019 held recently terming Nepal as 'rising star' of rising economy in South Asia; to the various countries of the world taking Nepal's peace process and its participatory government system based on competition as inspiring and exemplary; and to the formation of a stable and strong government through a mixed election system as a rational decision of Nepalis and their deep hunger for development.